Pulse is a low-medium cost project, which is of leasehold tenure. The development located in Gelugor, Penang was completed in August 2012 and developed by Nusmetro Venture. There is only one block with 30 storeys housing 249 units. The development density is average, with 10 units per floor. There are two layouts available when first launched, which are intermediate units or corner units. All units have 3 bedrooms and 2 bathrooms, and the only variation is the square footage as intermediate units have 783 sf whereas corner units have 850 sf. All units come with 1 unit of free parking, and extra parking spaces could be purchased from the developer at RM10,000 per space. Pulse is located in the township of Gelugor, which is right between northern and southern Penang. The nearer markets are Great Mark Mini Market and Sunshine Farlim. From the Pulse, the nearest hospital is the Lim Wah Ee Hospital for emergencies, and schools nearby include SK Bukit Gelugor and SMK Hamid Khan. Eateries and banking facilities could be found nearby at the E-Gate which is a commercial complex with entertainment outlets as well. The location of Pulse is central, between the two major townships of Penang Island. Tun Dr Lim Chong Eu Highway is easily accessible, and the Penang Bridge is merely 5 minutes away. Georgetown and Bayan Lepas are both roughly 12 minutes away by car. There is no public transportation infrastructure in the immediate vicinity, and he nearest bus stop is located in Jalan Sultan Azlan Shah which is a 10-minute walk. 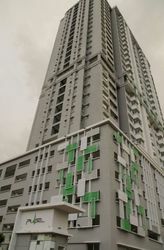 The developers of Pulse are also developers of Mutiara Heights which has garnered a nasty reputation for poor workmanship, though it has been a year since Pulse's completion and there have been no complaints as to workmanship. Pulse has also seen considerable appreciation as asking prices of the sub-sale units are twice that of when launched, currently starting from RM370,000. The intermediate units at Pulse are also classified under low-medium cost housing units which are regulated under state law. State law dictates that the units are not to be transferred to another person unless good cause is shown to a board. The corner units however, are excluded from its ambit. Looks like we couldn't find any matches. Try search on all Pulse ads.